The third dish is Oysters Rockeffeller with Twin Toppings. The richness of the sauce made the inventor of this dish name it after the richest American at the time Nelson Rockeffeller. But not only does it have such rich sauce, it also has divine succulence that inspires affection when enjoyed with one's special someone. Must be because of the aphrodisiac in oysters? 1. Top half of the oyster with tomato concasse, and then pour hollandaisde sauce. 2. Next top with breadcrumbs and mozzarella cheese. Set aside. 3. For the half of the oyster, top with pesto sauce then drizzle with a drizzle with a little hollandiase. Top with breadcrumbs and mozzarella. 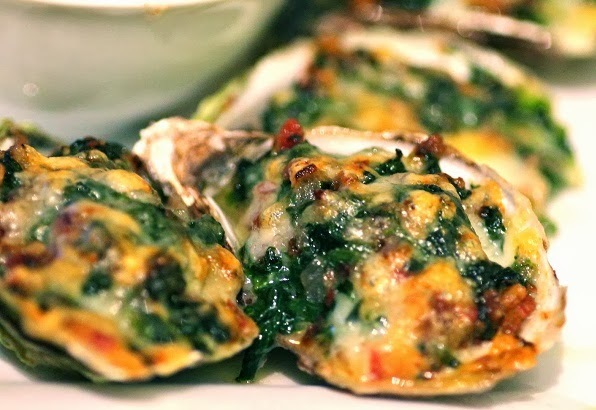 Then bake all oysters until brown. 4. Garnish with chopped basil.